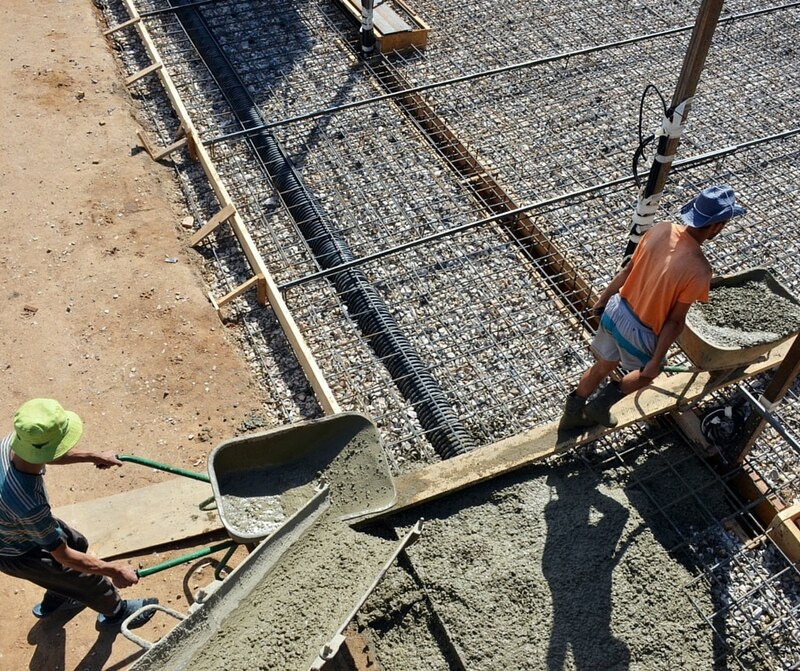 The compressive strength of concrete is tremendous. Incredible force is required to crush concrete. However, concrete has relatively weak tensile strength. Far less force is required to crack concrete by bending or twisting it than is required to crush concrete. To increase the tensile strength of concrete, reinforcing bar — rebar — is used to increase the tensile strength of concrete. A variety of rebar lengths and diameters are available, but there are only six common types of rebar: European (a carbon, manganese, silicon, etc. alloy); carbon steel (basic “black” rebar); galvanized; epoxy coated; glass-fiber-reinforced-polymer (GFRP); and stainless steel. The different types of rebar each unique strengths and weaknesses. The strength of European rebar is its cost. Made principally of manganese, European rebar is the least resistant type of rebar with respect to bending. While easy to work with, it is generally not recommended for use in areas that experience earthquakes nor for projects that require substantial structural integrity from its rebar. The most common rebar, “black” bar is used on every type and scale of project with few exceptions. The biggest weakness of black rebar is that it corrodes. When rebar corrodes, it expands cracking and breaking the concrete around it. For situations in which the rebar might be exposed to humidity or water saturation, there are better options than black rebar. However, with respect to is value/tensile strength ratio, black rebar is the best rebar available. Epoxy-coated rebar is black rebar with an epoxy coat. It has the same textile strength, but is 70 to 1,700 times more resistant to corrosion. However, the epoxy coating is incredibly delicate. The greater the damage to the coating, the less resistant to corrosion. Galvanized rebar is only forty times more resistant to corrosion than black rebar, but it is more difficult to damage the coating of galvanized rebar. In that respect, it has more value than epoxy-coated rebar. However, it is about 40% more expensive than epoxy-coated rebar. GFRP is a composite much like carbon fiber. As a result, field bends are not permitted when using GFRP. However, it will not corrode, period. In that respect, GFRP is an unparalleled concrete reinforcement bar. While it costs ten times as much as epoxy coated rebar per pound, it is extremely light, so the cost is only about double when considering talking linear feet. Stainless steel rebar is the most expensive reinforcing bar available, about eight times the price of epoxy-coated rebar. It is also the best rebar available for most projects. However, using stainless steel in all but the most unique of circumstances is often overkill. But, for those who have a reason to use it, stainless steel rebar 1,500 times more resistant to corrosion than black bar. It is more resistant to damage than any of the other corrosive-resistant or corrosive-proof types or rebar and it can be bent in the field. For all of your rebar questions, wants, and needs – contact our team at BN Products. We are leaders in rebar benders, cutters, and tiers. We also have a complete guide to working with rebar.